This year's Bertram 4H 3D Tournament will be held at the Burnet County Fair Grounds in Burnet, Texas. Registration is open now or walk up registration is also available. $15 for 4H members, $20 for non-4H members, everyone shoots (even adults!). Check in is from 0830 until 1300 day of the shoot, 30 target course. We have a spectacular raffle table this year! If you attended last year you know how good the swag was; and this year is shaping up to be even better! Come on out and support our local 4H archery club, get in on the raffle and have a great time shooting your bows! Registration form is attached, if you PM me your email I can also send it via email. If you want to check out some of the cool SWAG we will be raffling off this year check out the facebook page! Come help support our 4H kids and help grow the sport we all love so much! Bump for great kids and event. Just some of the raffle items that we have for this year's 4H 3D shoot! We have tons more stuff, this is just the big items! Yes, that's a PSE Decree! 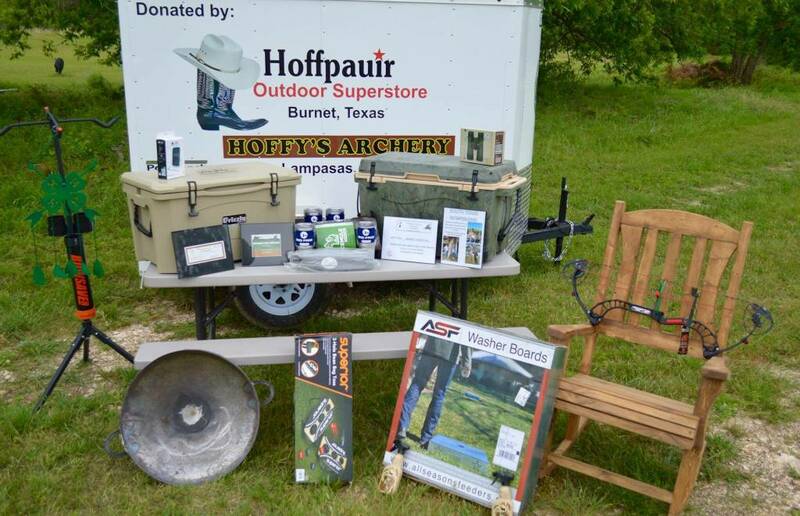 Come out and shoot, win some cool raffle prizes and support Bertram 4H! We will also have a silent auction for a guided bow fishing trip! More information on our Bertram 4H Facebook page! Our kids on the shooting line this Sunday practicing for the shoot this Saturday. There's going to be some stiff competition from the 4H shooters this year; better bring you're A game fellas! 90 yards (measured) slightly uphill. Delta Ibex. Scoring ring will be the center 12 ring, it will be highlighted with a bright, contrasting color. Each shooter will pay three dollars to shoot. Each shooter will shoot three arrows at the target. As many arrows hit the target will be the number of shots that archer will have in the final heat. Second Heat: Number of shots is based on how many arrows hit the target in the First Heat. First Heat: No scoring, this heat is to determine what number of arrows the archer will shoot in the Second Heat. Any arrow on the target counts regardless of where it hits the target; the arrow must stick in the target, glancing shots will not be counted. Second Heat: Each archer will shoot the number of arrows they qualified for from the First Heat. Scoring will be based on which archer comes closest to the center of the middle 12 ring on the Ibex target. Shoot Off: If needed, a shoot off will take place between the archers who had arrows an equal distance from the center of the center 12 ring. This will be a one arrow, sudden death match. Each archer will get one arrow to shoot and then the shot will be judged until there is a clear winner. Each archer will pay three dollars ($3.00) to shoot the Ibex Long Shot; the winner will be paid 50% of the total pay in amount (to be determined by the amount of participants). Prior to the start of the Ibex Long Shot archers will be allowed to inspect the target, pace off the distance etc. Archers will not be allowed to change the orientation of the target or add additional markers to the target. Rangefinders and Binoculars will be permitted for the Ibex Long Shot competition. Equipment class will be “unlimited” archers may shoot with any bow or accessories; crossbows will not be allowed. It's looking like I can make it Saturday. Probably bring a few extra arrows foe thw ibex shoot. Can't wait to see ya brutha!